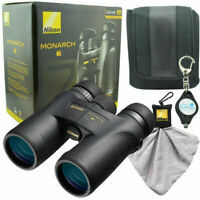 The Nikon Monarch 7 Binocular, 10x42, lets you get up close and personal with whatever you have in your sights. Featuring a high tech, premium Extra-low Dispersion glass, the lens and prism coatings also work to enhance your view and provide a wide field of view that gives you the same brightness and accurate colors as seen with the naked eye. 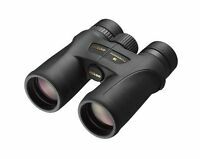 The fully multi-coated lenses provide clear and bright images even in unfavorable weather conditions, and the durable rubber-armored coating handles any terrain and environment incredibly well. A smooth central focus knob easily brings objects into focus, and the multi-setting, click-stop eyecups let you customize eye settings for maximum comfort and a full field of view. 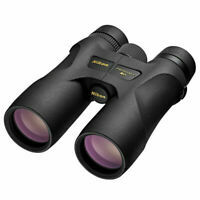 The Monarch 7 Binocular is waterproof and fog proof so you can continue your viewing in any weather conditions. I may be spoiled by the Swarovski SLC 10 X 42's I've been using on my job for nearly 18 years, so this review may be slightly biased. I purchased the Nikon Monarch 7's as a spare binocular to leave in my desk at work, and while adequate, I don't see much of an improvement over the older Nikon 10 X 42's (can't remember the model) I had nearly 20 years ago. Yes, they're lighter, and yes the twist out cups are helpful for people that wear glasses, but the image quality hasn't improved noticeably in all that time. There is, like other reviewers have written, an annoying amount of chromatic aberration. Color, especially at night, washes out at certain angles, even under the bright lights of the racetrack where I use them exclusively. 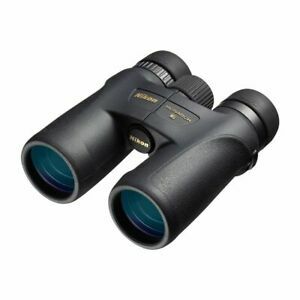 And, unless you twist the cups out, blackout is also an issue with this particular binocular, which is not an issue on the Swarovski's, nor on the much less expensive and older 16 X 50 Pentax I use sometimes. In summary, I don't think the Monarch 7's quality is worth the $400.00 + price tag retailers are charging. These are great glasses for the money. I'd put them up against the high dollar European glass for a fraction of the cost. I wish they came with a better neck strap/harness and eye piece covers, but overall, very satisfied.